Malacañang Palace vowed and assured that charges will be filed against top executives and parties involved in the P3.5-billion Dengvaxia anti-dengue vaccine fiasco as the Department of Justice (DOJ) is expected to issue a resolution on the case this month of November 2018. According to Presidential Spokesman Salvador Panelo some "forceful action" will be taken to put an end to the mess caused by what he described as a "failed" health program implemented during the Aquino administration. Spox Sal Panelo was quoted as saying "Appropriate charges will be lodged and pursued against government officials and private individuals found responsible by the DOJ for this failed health program for children,” Panelo said in a statement. The Palace also revealed that Pres. Rody Duterte himself is monitoring the issues surrounding Dengvaxia. "He (Duterte) hears all the calls for justice of families of children whose deaths are reportedly caused by the said vaccine," Panelo said. The implementation of the anti-dengue vaccine was suspended after French pharmaceutical company Sanofi Pasteur, manufacturer of the controversial Dengvaxia vaccine, issued in November 2017 a global advisory warning of the risks of administering Dengvaxia to persons with no history of dengue. Congressional investigations were held on the role of officials during the Aquino administration, which began administering the vaccine to at least 800,000 children in 2016. 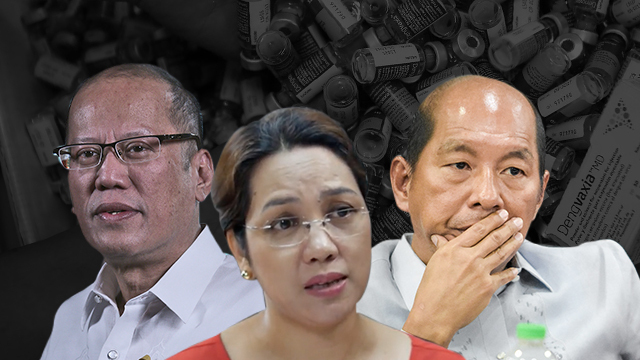 To date, graft and other criminal offenses have already been filed against former president Benigno “Noynoy” Aquino III, two former Cabinet officials, several former and incumbent officials of the Department of Health, and private individuals in connection with the controversial anti-dengue vaccine.